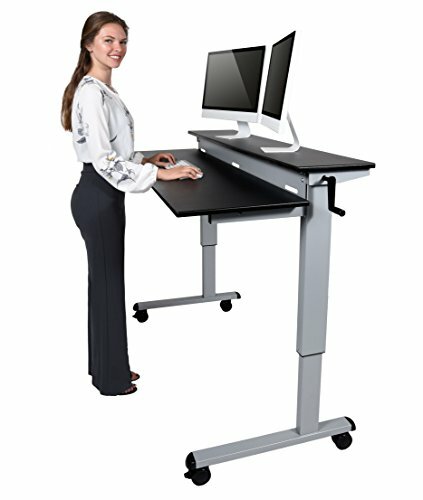 With the innovative crank adjustable height stand up desk its easy to achieve long lasting health benefits like burning more daily calories, boosted productivity, and improved posture. The crank allows for effortless on the fly adjustment from sitting to standing. The standing computer desk's shelves have a generous 59" wide work surface with a 14" deep top shelf and a 16" deep lower shelf. The shelves have 4.625" of separation; this allows for a unique 2-tiered system that puts your monitor and keyboard at the proper separated viewing and working heights. Everything needed for assembly is included, Overall dimension: 59"W x 28.25"D x 33.5 - 47.25"H. Model and props shown are not included. This product meets the minimum requirements of ANSI/BIFMA standards.